The New York neighborhood that powers America's capitalist engine is also one of the city's oldest, a place where you can discover many layers of urban history, if you know where to look. In this excerpt from his new book Magnetic City, the Pulitzer Prize-winning critic Justin Davidson leads a walking tour through the storied enclave. From the earliest days of urban Manhattan, how much you made mattered more than who you were. The Dutch who arrived in the seventeenth century did not come to do God’s work, or to glorify a king, or civilize natives, or escape persecution. They came because they spotted a good business opportunity. 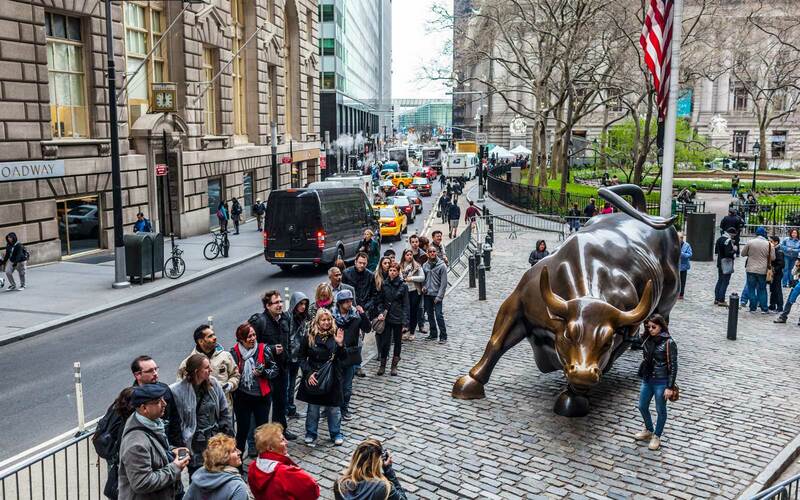 This single-minded preoccupation with finance has its obscene side, a truth you can hardly miss on a quick walk around a city where some people spend more on cuff links in an afternoon than others earn in a decade. But it has also molded a city where fanaticism gets few footholds, where eccentricities and freedoms thrive. To walk around Manhattan is to stroll among piles of unimaginable wealth, transfigured into houses and towers and parks — a metropolis ample and weird enough to attract people who don’t care about money at all. 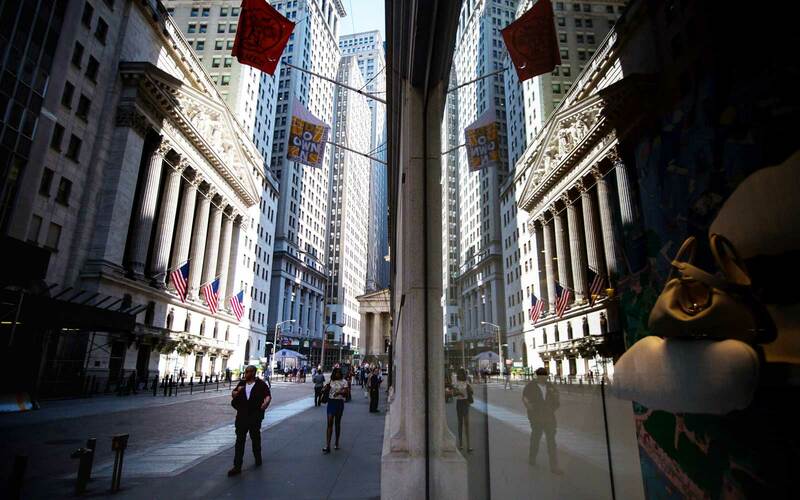 Money is the juice that nourishes New York’s growth. It flows through the world’s ducts, converges on the Stock Exchange, and gushes through Midtown banks, where it’s converted into Manhattan real estate, luxury goods, and tax revenue. Despite close competition from London and Tokyo, New York remains the world’s financial capital, and the cataracts of cash that fall onto the concrete city splash about and irrigate our expensive amenities. The rich drive up prices and wield power in blinkered and capricious ways. But they also enjoy, and pay for, parks and concert halls and hospitals and universities. The sums that circulate through the municipal treasury — nearly $80 billion in 2016 — mean that New York’s affordable-housing program, its police department, schools, parks, public library systems, and network of bike paths are all far and away the largest in the country. And so I come looking for New York’s grasping but generous soul in the Financial District, where the city began, where the geological force of money has sculpted artificial canyons and laid down sedimentary deposits of architecture. This is where the trade in hemp and sugar and slaves eventually gave way to equities and bonds. It’s where, when money fled in the 1970s, art crept in; where, when the money returned, it carried along a new tribe of downtown dwellers, who made room for play in a neighborhood built for work. 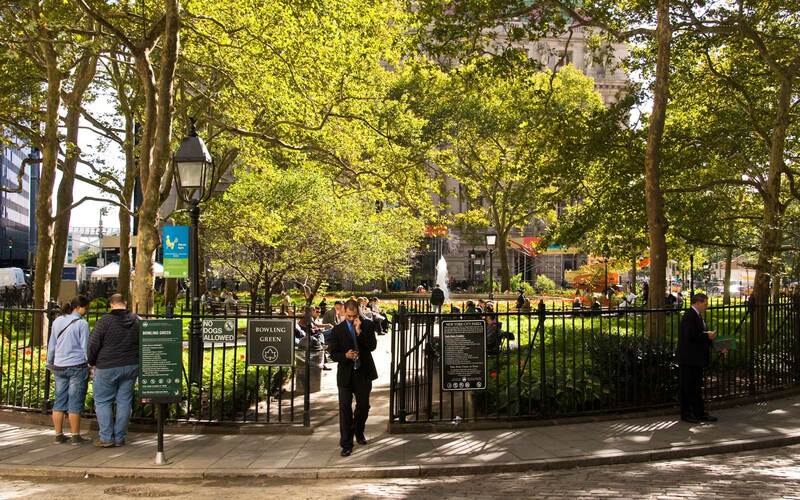 I wander through the parklet called Bowling Green, the flat clearing where, tradition has it, Peter Minuit bought Manhattan from the Lenape inhabitants in 1626. New York’s founding document is a real estate deal. Each side traded away something of modest value: Minuit handed over a collection of hardware and other European goods. In return, the Lenape recognized the obvious fact that they were sharing an abundant wilderness with a handful of confused whites. From the moment of that transaction, this spot has always been about business. Here the Dutch West India Company built its defensible headquarters, really just a crumbling mound of packed dirt they called a fort. And here began the northbound Native American trail, which the Dutch adopted as their own High Street (Heere Straat) and the British later called Broadway. I thread my way to the unpromising corner of Pearl and Broad Streets. It’s nothing much to look at now: a slightly claustrophobic intersection, presided over by Fraunces Tavern (54 Pearl Street), the 18th-century hostelry built on a soggy “water lot.” (It was already an ancient establishment in 1783, when George Washington went there to celebrate while the last British troops fled.) I can just barely make out Manhattan’s original topography in the way the pavement slopes gently down toward Pearl Street and then flattens out where it hits what in the seventeenth century would have been shallows. Pearl Street was called Dock Street then, and it was both the edge of New Amsterdam and its center. This is where I find a wormhole to New York’s remotest past. Standing amid the high-rises, inhaling exhaust, I try to conjure up the mingled odors of brine, tobacco, and tar. I strain to understand how the colonists’ urgent desire for financial success gave Manhattan its earliest form. Here, Peter Stuyvesant’s two-story mansion sat beside serried shops, wooden homes, taverns, and warehouses. Ships were moored at the sole wooden dock that poked into the East River. Sailors unloaded their cargo, hauled it across the dirt road to the Dutch West India Company, and lifted it into the upper-level storeroom by a pulley fastened to the brick façade. Dutch New Amsterdam was hardly more than a rustic hamlet, but already neighborhood dynamics were visibly at play. Even this tiny nub of the future megalopolis had suburbs. The gabled houses thinned out to the north and west, facing roads but backing onto gardens, yards, and fields. 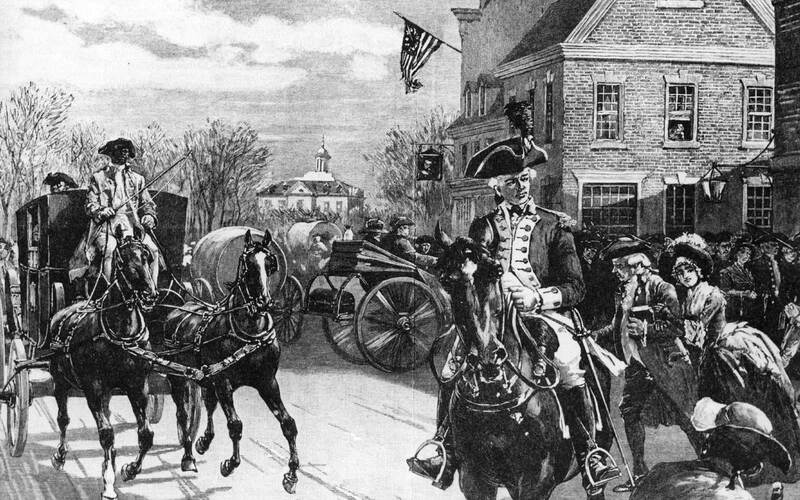 Governor Stuyvesant commuted two miles on horseback every day from his exurban estate in Greenwyck (later Anglicized to Greenwich Village). By the time the British took over in 1664, the city had already developed some of the maladies that still pit neighbors against one another: slums, ethnic conflict, and NIMBYism. Poor Dutch holdovers from the old regime clustered along Broad Street’s side alleys, and in an early imposition of zoning, authorities insisted that cobblers take their foul-smelling tanning pits and get out of downtown. Ah, the reek of early New York. You could construct a whole alternate history of the city through pollution and garbage. Both have always been plentiful, as always when you cram large numbers of people together. Today, we tend to think of trash as an expensive excretion, shipping it far away and paying other states to take it. In the past, though, New York treated garbage as a resource and managed to squeeze out of it the most valued yield of all: land. That’s the reason Pearl Street sits two blocks back from the water now. Soon after England took over, the city began colonizing the damp ground between high and low tides and inaugurated the local tradition of the public-private partnership by turning over this newly created property to owners who promised to improve it with wharves, streets, and a seawall. That didn’t always happen. Often the owners just built their houses and ignored the rest. For most of the city’s history, the river was where the money — and therefore the action — was. In 1979, Madonna arrived in New York and told a cabbie to take her “to the middle of everything.” He dropped her at Times Square. 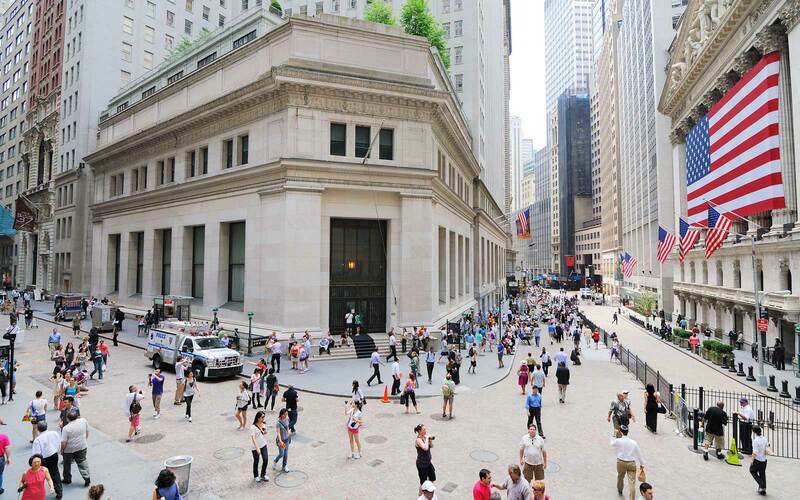 But if she had stepped off a vessel at Burling Slip in around 1800 and wanted the same thing, she would have been pointed toward Tontine Coffee House, at 82 Wall Street. Standing in front of the stodgy brick-and-stone office building where the coffeehouse used to be, I can almost experience the scene: the urgent, mysterious rituals of exchange, the sense that greed, ambition, and civic pride were all concentrated on the house’s cramped porch. The frenzy accelerated after the 1825 opening of the Erie Canal, when New York Harbor became a vestibule for the American hinterland. Soon, tides of bankers, brokers, lawyers, bookkeepers, and politicians sloshed daily between the docks and the grand new marble Merchants’ Exchange on Wall Street. The buildings are gone, but the money-fueled intensity remains. One December night in 1835, a security guard smelled smoke. In one of the many jammed warehouses downtown, some scrap of wealth awaiting shipment caught fire — a bale of cotton, maybe, lit by a dropped cigar or a spilled oil lamp. In minutes, the frigid wind off the harbor tossed the flames from window to window and roof to roof. Firefighters flailed and pumps seized up; near the shore, the East River was frozen solid. Crowds frantically hauled valuables to the Old Dutch Church, a solid brick building. It was said that a couple of hours later, when the fire swept into the nave, feeding on pews and salvaged ledgers, someone rushed to the doomed organ loft and played Mozart’s Requiem as the flames rose. More likely, hot air rushed through the pipes, producing eerie unmanned blasts. When the fire finally burned itself out on the second day, Lower Manhattan was a charred hellscape. The Merchants’ Exchange and the Tontine Coffee House were gone. Dozens of ships, cut loose so the flames wouldn’t leap aboard, drifted offshore like so many Flying Dutchmen. Lower Manhattan has been shaped by crisis and rebirth: the Depression, the fiscal crisis of 1975, the 9/11 attacks, the financial meltdown of 2008, Hurricane Sandy. Each time, the city has retooled. And as we try to prepare for the next onslaught, it’s worth recalling the devastations of the past and how resiliently New York reacted to them. In fact, the 1835 fire — like the Chicago fire and the 1906 San Francisco earthquake — jolted the city into foresight. Two centuries after the city’s founding, this was still a rough, hurried place slapped together out of salvaged timber and hand-molded brick. The generations who built New York had their eye not on posterity but on the immediate future, when loans came due and investments might pay off. After the fire, with most of the 17th- and 18th-century city wiped out, New York reseeded itself. 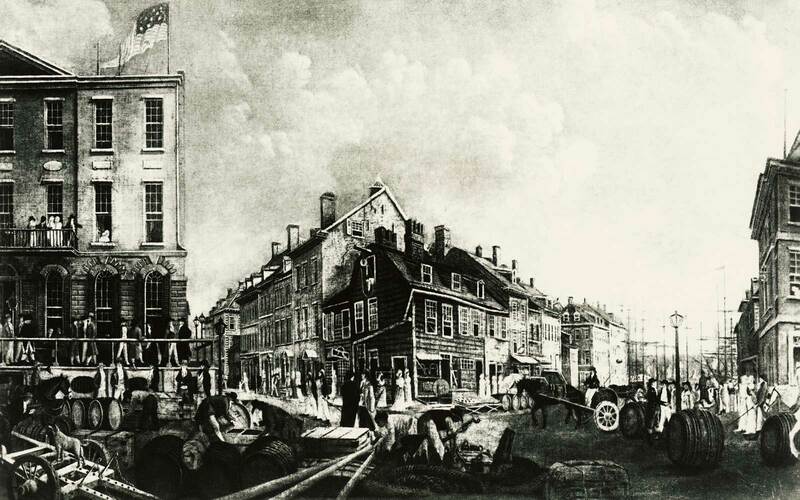 Businessmen built a more lavish and durable set of storehouses, banks, and exchanges. They began to think in terms of permanence. Fire codes were rewritten. Water was piped in from upstate. Two days’ total destruction was a blip when what mattered most was that the flow of goods, people, and credit remain unobstructed. Just three years after the fire, in 1838, the SS Sirius chugged into New York Harbor, eighteen days out from Ireland, winning a transatlantic race with the Great Western, which came from Bristol, England. The era of the steamship had begun, and the pace of commerce accelerated again. It’s hard to look back on those years without admiring the creative energy of capitalism. Fires recurred, and destruction was a fact of life — but so was the craving for wealth that expressed itself in urban design. By the mid-19th century, New York had outgrown its makeshift look, and its businessmen built a grand Merchants Exchange at 55 Wall Street. 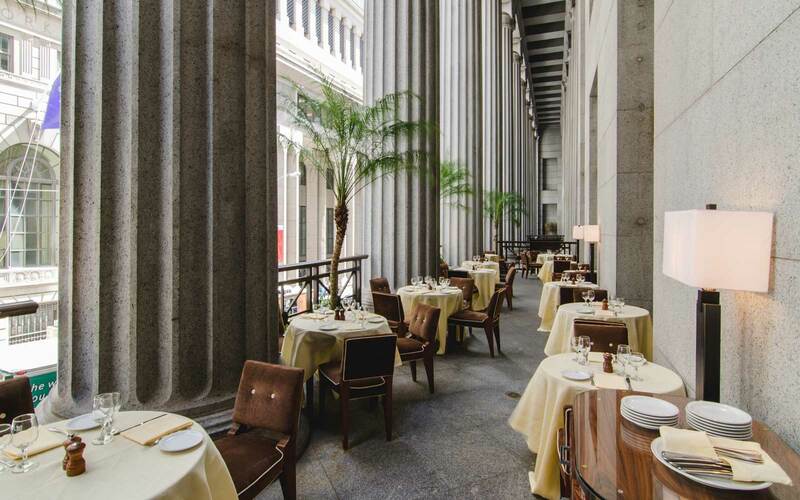 This temple of money boasted echoing hallways, massive columns, and enormous quantities of granite. Today, it’s the event space Cipriani's, which can comfortably seat 800. In New Amsterdam days, a couple of simple houses stood on this corner, backing onto orchards and gardens and facing the Wall, the protective wooden fence that separated town from wilderness. And yet today, as I stand at this thronged intersection, where visitors from all over the world come looking for the brain stem of the world’s multi-tentacled financial monster, I’m struck by how consistent the neighborhood’s spirit has remained even as it has physically transformed beyond recognition. The global goods that flowed through the New Amsterdam waterfront; the raucous bustle of the Tontine Coffee House; the frenzied lading of steamships in the nineteenth century; the fortunes that year in, year out, have rushed through these narrow alleys, enriching some and beggaring others — all that relentless pursuit of wealth has kept New York’s oldest neighborhood perpetually young. This excerpt is taken from Magnetic City: A Walking Companion to New York.